Guyana is a melting pot of people, nations, languages and cultural traditions. Geographically, it is as diverse as it is culturally. There are mountains, valleys, rain forests, sandy plains and coastal regions. Historically, there are influences from the Dutch and the British and a slave history from Africa and India. It is a land that is full of diversity, but calls itself by one name. Guyana’s motto is “One People, One Nation, One Destiny”. For a country so fractured in many ways, it has accomplished just that kind of unity. Let’s discover Guyana’s richness, resources and robust way of life. On the northern tip of South America between Venezuela and Suriname lies Guyana, land of many waters. To the north of it is the Atlantic Ocean, cradling the Caribbean countries. To the south of Guyana is Brazil. Strongly allied with the Caribbean islands to its north, Guyana has always been considered more of a part of them than the mainland. 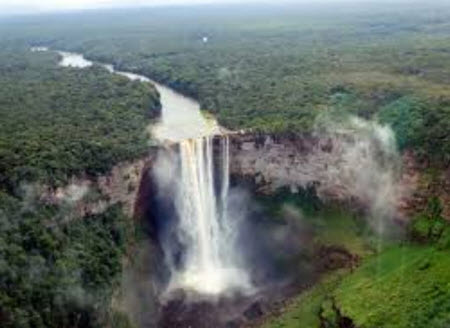 Physically, Guyana is 83,000 square miles in land mass. But it is the third of the smallest sovereign states of South America. Thanks to the Amazon River and the Orinoco River which run through its land, Guyana is a place with much beauty and bounty. The land of many waters has produced one of Latin America’s largest untouched and unspoiled rainforests. Only a place like this could still be found to have had little to no human influence. Prior to colonization, Guyana was inhabited by the nine indigenous tribes referred to as Amerindians. Although it is the only English speaking country in South America at present day, it did not begin as such. The Guyanese tribes that flourished prior to Dutch rule were the Kalina, Wapishana, Patamona, Pemon, Wai Wai, Macushi, Warau, Akawaio and Lokono. Originally settled by the Dutch, it was soon colonized by the British in 1814 and governed so until 1966. At this point Guyana claimed its independence and became a republic finally in 1970. It is now officially called the Cooperative Republic of Guyana. To this day it has managed to keep quite a bit of the structural components of the British rule and influence. There is a strong slave history in Guyana. Thanks to the Dutch East and West India Companies, the slave trade with Africa was profound. From India, slaves were brought over as indentured servants. Descendants of these slaves and servants have intermarried with the indigenous peoples of Guyana to help make the general population what it is today. Sir Walter Raleigh is said to have explored the region, writing of its amazing terrain and wonderful bounty in the legend of El Dorado. As a result of his visits there, an English settlement was established. Sir Arthur Conan Doyle’s inspiration for some of his writings stem from Guyana, making the land more mysterious and unconquerable than ever. Unfortunately, there is also a sad legacy for one of the cities named for Jim Jones. Jonestown was a place settled by the cult group People’s Temple. It gained worldwide attention when 918 members of the group died from mass murder and suicide. Hundreds of children died along with their parents from the ingestion of cyanide tainted Flavor Aid in efforts to follow their leader’s instructions. There were mostly Americans who followed Mr. Jones to their death. The motive for this points mostly to the insanity and rapidly declining mental and physical health condition of Jim Jones. Perhaps one of Guyana’s most important industries is its intrinsic value. It holds in its vast rain forests the unique and optimum conditions for some of the rarest orchids on the planet. Four thousand plant species occupy space in these forests and are found nowhere else on earth. Guyana’s plant life manages to sustain an incredible amount of animal species with great diversity. It is for the reason of sustaining such a beautifully undefined place that ecotourism has risen as one of the country’s most important industries. Natural resources are plentiful in Guyana. Gold, mineral and bauxite mining are big industries. As recent as 2015, oil was discovered in several areas which will help to bolster the economy greatly as well. Agriculture, specifically rice and sugar are big industries. The sugar industry, in particular employs the most people in the country and owns 28% of its overall exports. Timber mining and shrimp fishing are also important to the economy. If you like Caribbean food, you would be happy in Guyana. Although not technically an island nation, its culture and food are heavily influenced by the Caribbean islands. The influences also stem from the Arabian, African, European, indigenous Amerindian, and Chinese people that have come to inhabit this land. Rice and beans, representative of most island nations is a dish that is very popular in Guyana. Curried recipes, chicken dishes and fried fish are popular. One of the more popular dishes is cassava bread, along with Guyanese creole, plantains and okra. Pepper pot is the national culinary darling of the country. It is made with a stewed meat that has peppers, cassareep sauce and cinnamon. It is saved for special occasions typically like Christmas. Casinos and other types of gambling are legal in Guyana. There are several casinos you can visit. Two of them, the Carnival casino at the sleepin Hotell and the Guyana Princess Hotel and Casino, is located in Georgetown. Online gambling is widespread in the country and several casinos operate in the country. The most popular online casinos include CasinoLoco (now closed), Yako Casino, Campeon Bet Casino and MegaCasino. It is lega for online casinos to offer casino bonuses to attract new clients. The gambling is regulated by the Gambling Prevention Act which is designed to prevent problem gambling. Some of the must see places are natural wonders like the largest single drop waterfall on the planet. Kaieteur Falls is located in Kaieteur National Park and falls a total distance of 226 meters. 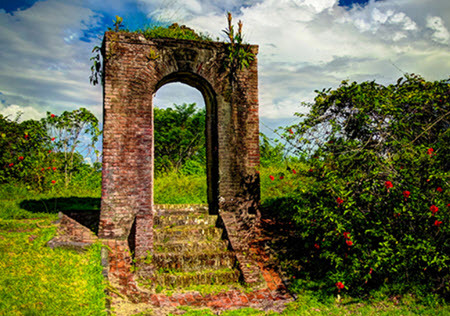 It has been nominated, unsuccessfully to date, by Guyana to become a UNESCO World Heritage Site. The greenheart tree as well as several other plant species are only found and seen in Guyana and certainly worth the visit. The Guiana and Guiana Highlands have been recognized by the World Wildlife Fund, as well. One other natural beauty, in addition to all of the wildlife is the Iwokrama Forest and the Kanuku Mountains. Some of the more popular and recognizable landmarks in Guyana are St. George’s Anglican Cathedral in Georgetown. There is also the Berbice Bridge which is the fourth, longest floating bridge located on the Berbice River. Not to be forgotten is the Stabroek Market which is located in Georgetown and is known for the hustle, bustle and the people that gather there to do business and trading. It would be worth visiting to get a good idea of what life is like in Guyana among the locals. Guyana is a richly diverse place in respect to its people, land, terrain and its resources. It is valued not only for what it can produce and add to the world economy but also for what it means to the world at large. It is still one of the few places above the ocean and below the stars to offer such relatively untouched beauty.